rec. 17-22 April 2018, Teatro Regio, Turin. The Lombards of the First Crusade, I Lombardi alla prima crociata, was Verdi’s fourth staged opera, premiered at La Scala in February 1843, ten months after the great success of Nabucco, after which Verdi was quick to realise that the Italian audience related their own political situation, under Austrian occupation, to the oppressed Jews of Nabucco. Any subject showing Italians united against a common enemy would be off to a flying start in occupied Milan, albeit with the Austrian censor likely to be a stumbling block. In this case it was the Church that took exception to the subject of the opera. Fortunately, the police chief, a music lover, let the libretto pass with only minor amendments such as Salve Maria instead of Ave Maria, as much for form’s sake as any other. A great success in Milan, I Lombardi was quickly staged in the rest of Europe, a situation considerably aided by Verdi himself, as at Venice, where he insisted on a staged production of the work to go along with the commission for the opera Ernani. Verdi’s growing stature as a composer was such that Merelli, intendant at La Scala, asked Verdi to name his own fee for I Lombardi. Uncertain, the composer sought the advice of Giuseppina Strepponi, creator of Abigaille in Nabucco and later his mistress and wife. She advised him to ask what Bellini asked for Norma (Budden. The Operas of Verdi. Vol 1. Cassell 1973. p115). I Lombardi dispenses with an overture, and opens with a short prelude which leads straight into the first of several choruses spread throughout the work, (CHs.2, 13, 24 and 26), the latter having significant echoes with the famous Va pensiero of Nabucco. The chorus are major players in this opera. The strong vibrant tones and the squillo of an Italian chorus has a significant part to play in many early Verdi operas, and none more so than the large Turin forces in this performance. These various choruses in his early compositions were major influences in Verdi’s personal association, and that of his early period music, with the Risorgimento, the fight for Italian independence from the Hapsburg and French Empires. Verdi himself became and elected representative in the first Italian Parliament in 1860 under the leadership of Cavour. Only three of the opera’s characters, Pagano, Oronte and Giselda are listed as for ‘prima’ voices. Rather strangely, the substantial role of Arvino is listed in the original libretto as tenore comprimario, this even though the character is on stage and sings quite a lot and any weakness in the casting of this role can seriously undermine the performance. Perhaps the role description as comprimario was because Arvino does not get a solo aria, merely featuring in duets and ensembles. In this performance, Giuseppe Gipali sings with bright forward tone; furthermore, his ability to act as well as express emotions in his singing, leaves no chance of his being over-parted. Likewise, his wife, Viclinda, sung by Lavinia Bini, is an appealing presence when she appears on stage, singing with clarity, excellent phrasing and tonal beauty. As Pagano, the brother who commits parricide in the belief that he is murdering his sibling Arvino, Alex Esposito acts well and sings with steadiness and good characterisation in what I believe is his first major Verdi baritone role. His portrayal of the hermit who helps in the taking of Antioch by the crusaders, is a bonus to his evolving vocal skills and strength. As his squire Pirro, Antonio Di Matteo in a secondo basso role also has the requisite tonal security allied with clear diction and considerable physical presence. The Giselda of Angela Meade is the singing star voice in this performance. A sometime winner of both the 2011 Richard Tucker Award and the 2012 Metropolitan Opera Beverly Sills Artist Award she is a soprano of considerable vocal gifts in terms of range, tonal beauty and expression. She has been taking significant solo roles at the Met, including the title role in the 2018 revival of Rossini’s Semiramide, albeit her physical size does not make her ideal for some spinto soprano roles for which she is vocally ideally equipped. In this performance, with the aid of costumes, she overcomes any physical limitations and deservedly carries the vocal laurels and is much appreciated by the audience. The primo tenor role of her lover Oronte, son of the tyrant of Antioch, is sung by Francesco Meli who also sang the role in the Tutto Verdi series recording of this work from Parma in 2009 and where he is alongside another big voiced soprano, Dimitra Theodossiou. I awarded my personal imprimatur of Recording of the Month to that recording (review). His voice has grown significantly in the intervening years as he now moves to more spinto like roles and repertoire. Regrettably, his move is not wholly for the better. He now sings more loudly and sometimes forces his voice to the point of a near wobble in his eagerness to make a dramatic point. To my ears he has lost something of his earlier capacity for elegant phrasing. The costumes by Jean-Guy Lecat are in period whilst the set by Fernand Ruiz is something of a melange of styles, acts one and four being artistically representational whilst that for Act 3 looks like the outcome of a twentieth century bombing raid, have little relevance to the hermit’s cave of the unfolding story. The orchestral support, like the chorus work, is first class under the baton of Michele Mariotti. 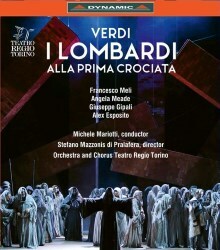 Appendix: The re writing of I Lombardi for Verdi’s first composition for Paris. Whilst in Milan composing Macbeth, Verdi was visited by the London impresario Lumley and agreed to compose an opera for that city, the subject chosen being I Masnadieri. It would be the composer’s 11th opera and was premiered on 22 July 1847. The composer travelled to London via Paris, staying briefly and seeing his friend, and later mistress and wife, Giuseppina Strepponi, who lived and taught there. Verdi conducted the London premiere and second performance of I Masnadieri with Michael Balfe, friend of Rossini and composer of The Bohemian Girl and Maid of Artois, taking over when Verdi returned to Paris, where, as well as well as seeing a lot of Strepponi, he accepted a commission to write a work for the Théâtre Académie Impériale de Musique, (The Paris Opéra), the composition specified to be premiered in November 1847. With its high musical standards and generous fees, composition for The Paris Opéra was considered as the ultimate aspiration for all nineteenth century Italian and other composers. Given the pressure of time, Verdi followed the example of his great Italian predecessors, Rossini and Donizetti, in adapting an existing work when first invited to compose for the French capital. For this purpose he chose his 4th opera I Lombardi alla prima crocciata of 1843. This adaptation became Jérusalem, Verdi’s 12th operatic title and featured tenor Gilbert Duprez, creator of Edgardo in Donizetti’s Lucia di Lammermoor. The French librettists, Royer and Väez, produced a libretto that was no mere translation of the Italian I Lombardi albeit the shape of the plot and the historical period of the crusades remained the same, with the Italian crusaders of Lombardy becoming the French, from Toulouse. Verdi wrote a new orchestral introduction to replace the brief prelude of I Lombardi, and as well as the required ballet music, de rigueur at the Paris Opera. He also composed substantial additions to the score. Importantly, he discarded the rather immature scene in which the deceased Oronte appeared from heaven complete with aria. Jérusalem was a moderate success at its Paris premiere on 26th November 1847. The changes are sufficient for Jérusalem to be considered a separate entity from I Lombardi. A film of the revised work is available on a performance in 2000 from The Teatro Carlo Felice, Genoa. (Arthaus Musik 107 329. 2 DVDs - see review). Although Verdi had high hopes for the Italian translation of Jérusalem as Gerusalemme, these were only partially realised. However, the changes in Jérusalem from I Lombardi were sufficient for both operas to circulate simultaneously in Italian theatres for some years.